Arsenal manager Unai Emery has hinted he may revert to using Pierre-Emerick Aubameyang as an impact sub at points this season as he’s well suited to changing a game from the bench. This is a somewhat surprising message to be conveying ahead of Arsenal’s big game away to Manchester United this evening, with Gunners fans unlikely to be best pleased to hear their top scorer may not continue to start games. 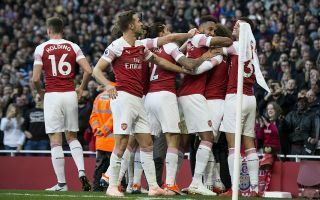 Aubameyang was the hero in the North London Derby at the weekend, scoring twice in a 4-2 win over Tottenham to go top of the Premier League scoring charts. The Gabon international has generally been a big hit since moving from Borussia Dortmund to Arsenal, and although it’s true he has done well when introduced from the bench, fans will surely want to see him starting games more often than not. It remains to be seen how Emery will use the 29-year-old at Old Trafford this evening, but it seems he wouldn’t rule out a bold move up front by benching his top scorer at some point. ‘I want his best performance and also for the collective,’ Emery is quoted in the Metro. ‘In his career he has played as a winger on the right, on the left and like a striker. He played with two strikers.